As part of my ethnographic research on the WISERD Civil Society project examining participation over place and time, I’ve spent the last year or so visiting two north east Wales villages, where I’ve been interviewing local residents and surveying neighbourhoods. The location of each research site is about an hour away from my house and I’m usually there by mid-morning, by which time the mugs of tea from breakfast have worked their way through and I’m inevitably on the lookout for some local facilities. On my initial visit to our first research site, the public toilets, run by Wrexham Council, were firmly closed. With no other options presenting themselves, I drove on through the village to do a different kind of ‘field’ research. On visits to both of our sites, the weakness of my bladder increasingly required me to consider public toilets as being sites of interest in our study of civil society, illustrating conflicts between ordinary people, the state and the market. It has been reported that 1,782 public conveniences have closed across the UK in the last decade with some local authorities, including Merthyr Tydfil, no longer having any council-funded toilets. 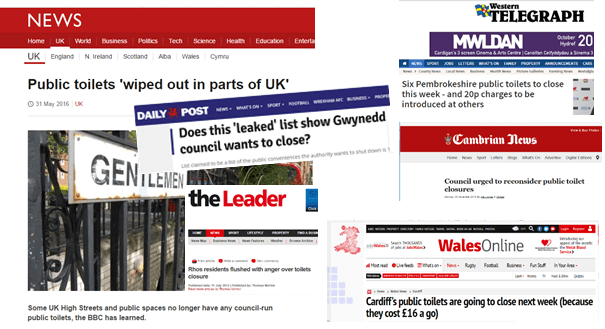 In 2012, the Welsh Assembly’s Health and Social Care Committee‘s inquiry into the public health implications of toilet closures concluded that a lack of adequate public toilets can severely affect a person’s ability to leave the house and engage in the community. Yet the closures have continued. In some areas of Wales, this has resulted in direct action, for example in Gwynedd, where plastic buckets labelled “Emergency Public Toilets” were placed at road junctions to highlight plans to shut two thirds of the county’s loos. The process of toilet closures has clearly been fuelled by austerity and local council cuts that have seen the paring of non-statutory services. Yet as others have suggested, austerity has been used as an extension of a neoliberal agenda – as an ideology or an inevitable stage of capitalism. In many areas of Wales, public toilets have been effectively privatised through the Welsh Government ‘Community Toilet Grant Scheme’, whereby local businesses are paid to open up their toilets to the public. In this form of privatisation, we see the taxpayer providing the funding while private capital takes the profit with little or no risk. Services are effectively still free at the point of delivery, but with no democratic accountability that might ensure they are accessible and open when the public need them. Yet this form of privatisation can only work where there are businesses interested in offering the service, leaving many smaller and rural communities struggling to cope with a shrinking public realm. We have seen in our research sites that different histories – including patterns of economic and social development, population movement and community networks – result in different outcomes for their public conveniences. In our first research site – a former coal mining village – the closure of the public toilets seems to be have been accepted with some inevitability and little resistance. This is reflected in our wider research, where support for other community facilities by the local council has, to date, mitigated some of the effects of de-industrialisation. However, now services have uncertain futures we have questions about the strength and ability of local civic and civil society to fill the voids. In our second research site – a more rural village – the situation is very different. The local authority’s proposals to close their public loos resulted in the Community Council taking responsibility for them without hesitation. They employ their own cleaner, paid from the parish precept, and the local community gardening group has recently spruced-up the surrounding area and planted flowers outside. We might therefore conclude that public toilets are representative of other areas of communal life, where supportive civic infrastructure, robust local networks and the commitment of local volunteers represents a strength of civil society that enables some localities more than others to deal with the economic and social challenges of advanced, globalised capitalism.